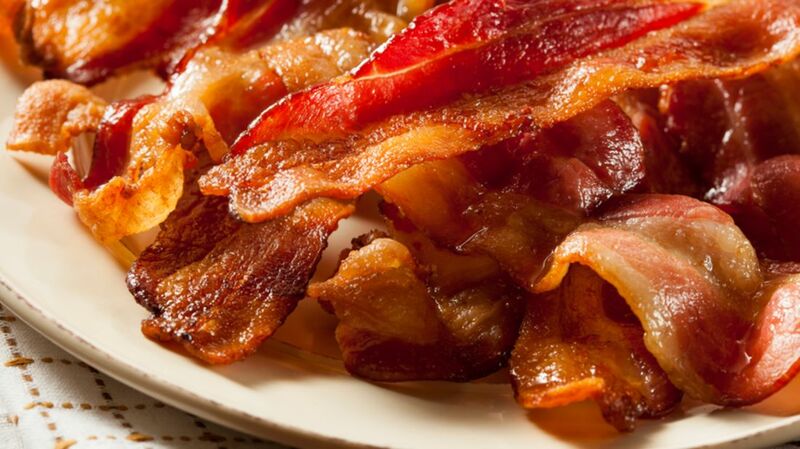 Bacon’s popularity isn’t new—food historians say this crispy breakfast meat was a common Roman-age snack (they ate it with figs) that evolved into a simple breakfast side. But after a few centuries, bacon deserves some recognition as a versatile ingredient that can be used in all kinds of new (and extreme) ways. If adding two or three slices of bacon on a burger just isn't enough, the 100% Bacon Burger from Foodbeast features the sliced meat in every component, including a bun made with bacon bits and pork rinds, a bacon patty, a bacon-crusted fried egg, and bacon barbecue sauce. But this adventurous burger doesn’t come cheap or easy. To make it at home, you’ll need at least five pounds of sliced bacon. Bacon is the perfect addition to almost any food. Jalapeños, potatoes, and shrimp are all made a little better with bacon wrapped around them, but some cooks take it one step further by wrapping pounds of meat in pounds of bacon. The Bacon Explosion basket from BBQ Addicts weaves seasoned bacon around two pounds of Italian sausage, which is stuffed with fried bacon and barbecue sauce. After two hours of cook time, dinner (and a heart attack) is served. Think basic tater tots can't be improved upon? Think again. Bacon-wrapped tater tot bombs are a little work, but are well worth the effort. Cheese and bacon are wrapped around each tot and then baked to crispy perfection. Within 25 minutes, you’ll have the best meat-and-potatoes appetizer ever. With these doughnuts, you won’t have to worry about watching your carbs. Called bacon doughnuts simply because they resemble the ring shape, this recipe utilizes mozzarella sticks, pineapples, and onions, which are stacked together and wrapped in bacon. Grill to create an ooey gooey, sweet snack, and serve with a side of marinara sauce. For a meatier, messier dessert, consider two dollops of ice cream in a bacon cone. Weave bacon around a sugar cone or a cone mold made from aluminum, then bake so the design holds its shape. And if you’re craving even more bacon, fill your cone with a maple-bacon crunch ice cream. If a bacon cone doesn’t ease your sweet (or meat) tooth, there’s always the bacon weave ice cream sandwich. A thick layer of ice cream is layered between two woven bacon patties to create a sweet and salty treat. The trick to this pork-laden dessert is a structurally sound bacon weave, a skill every home chef should have in their back pocket. Love beer and bacon? Now you can have them together with beer-glazed bacon. PopSugar shows how to mix honey, maple syrup, and a dark lager beer to create a thick glaze; a touch of mustard adds some balance to avoid a complete sugar rush. The biggest downside to this recipe is having to smell baking bacon for nearly 45 minutes. Ever thought the main meat missing from lasagna was bacon? This recipe can change that. Wrap leftover lasagna with bacon (firm or cold lasagna works best), and then deep fry the block for a cheesy, pasta-filled comfort food for even the worst of days. While the ingredient combination isn't that of your sugary cookie, these bacon onion cookies offer a new perspective on savory desserts. The thick mix folds crumbled bacon into a gluten-free dough, with a touch of onion powder and sea salt for a rich flavor. And, young chefs can enjoy mashing the textured dough with a fork, just like you would with peanut butter cookies (except, with more bacon). Sure, you can have a side of bacon with breakfast. Or you can put bacon on one of your breakfast sides. Bacon jam can spruce up boring toast or a basic bagel, and it’s easy to make at home with this recipe from The Kitchn. With a pound of bacon, onions, and maple syrup, you can create a meaty condiment that's in a league of its own. And, this versatile spread can be used throughout the day as a sandwich spread for lunch or a topping for dinner rolls. You’ll need bacon, beer, and a grill to create these stuffed burgers. The BBQ Pit Boys, a YouTube group of barbecue experts, crafted this extreme dish featuring three-quarter pound burger patties heavily wrapped in bacon. The beer can comes in handy to mold the beef patties for stuffing with veggies and cheese (though adding more bacon isn’t a bad idea). Instead of coating mozzarella sticks with breading, consider wrapping them in bacon. For these at-home appetizers, simply wrap sliced bacon around chunks of mozzarella cheese, then deep-fry to crispy perfection. Just be sure to wrap the bacon tightly and secure with a toothpick to avoid a stringy, cheesy mess. If you’ve mastered the bacon weave, it’s time to put your skills to the test. Woven (and baked) bacon is trimmed to a circle, then hung over kabob skewers to set a taco form. While this sounds time-consuming for just one taco shell, this crunchy contraption is well worth the work. And if filling it with meat, lettuce and salsa isn’t enough, you can add a layer of macaroni and cheese for a meal that even Taco Bell wouldn’t attempt, or fill it with ice cream and coat it in chocolate for an upgraded Choco Taco. Yes, it is possible to combine your childhood love for caramel apples with bacon. These bourbon caramel apple bacon bombs include all the usual caramel apple fixings, with a little bourbon and a lot of bacon thrown in. Apples are wrapped with bacon, then smoked or grilled before being slathered with a homemade caramel bourbon sauce. Luckily, you don’t have to wait for autumn to enjoy this traditionally cool weather treat—bacon-wrapped foods can inspire cravings at any time.